The Korean Hep B Community Education project team had a great time at the big Sydney Korean Festival at Tumbalong Park in Darling Harbour on Saturday and Sunday 5 and 6 May 2018. We had a booth named “Hep B, Could it be me?” to attract people to start talking with us. About 350 people approached our booth and showed interest in our hep B quiz and free resources. They appreciated us giving this important information to the community in a proactive way, and loved that everything was free! 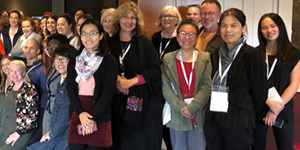 Six volunteer students from Macquarie University’s Graduate School of Interpreting and Translating came and helped us to explain valuable hep B information to festival participants. 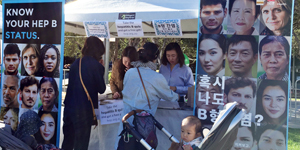 We gave out hundreds of resources in Korean language to help get the message out to the Korean community in NSW, that hep B is an issue that needs action including to test, then vaccinate or monitor regularly, and that people with hep B can live a long and healthy life.